Westerners and many other nations have lost all patience for refugees. 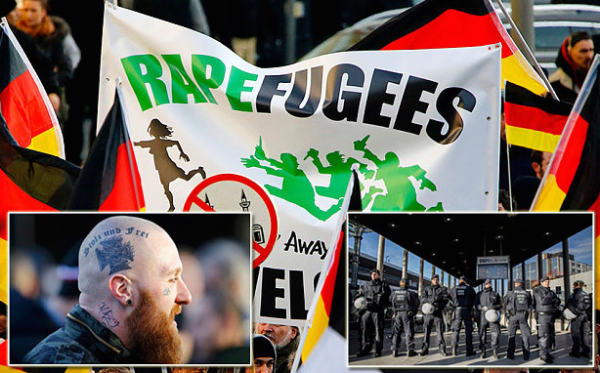 1,700 Germans attended a rally that waved an antimigrant flag. You know it’s bad when even the “compassionate” Westerners have had enough of these people. they certainly have worn out their welcome. I’d say we have been pretty hospitable but we have to look at the facts, they bring a severely increased risk of danger! Reports now indicate a rogue band of “bikers, hooligans and bouncers” organized a migrant “manhunt” on Facebook before attacking a group of Pakistanis in Cologne. Cologne tabloid “Express” reported on Monday that a group of “bikers, hooligans and bouncers” had used Facebook to plan a “human hunt” to “clean up” Cologne’s city center. Early on Monday, a police spokesperson was unable to confirm the reports. This last Sunday Police were tipped off about terrorist groups that were looking to rile the public. When officers were deployed several identity checks were performed and four people out of the small number they did check were detained. Two face criminal charges and the others penalties are still being determined. That was just this last tiny check the police did! That could have been another major story on the news of death and destruction from terrorists, but because they were allowed to protect themselves lives were saved.